Guide visitors through a shopping process without the page reload with our ajax cart Magento extension. Bring them with only positive experience without boring steps through the website. 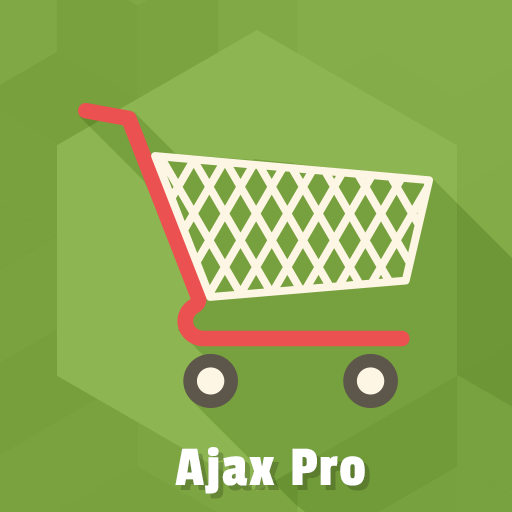 Ajax Pro 3.0 is aiming to improve the speed, overall usability, and efficiency of your Magento store. Allow your customers to add the products to the shopping cart on every page of your website. Offer them to add the items to compare and wishlist list and get desirable products always at fingertips. 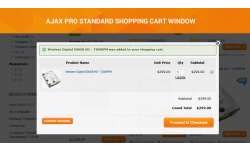 Generate the additional sales with popular items output in ajax shopping cart. 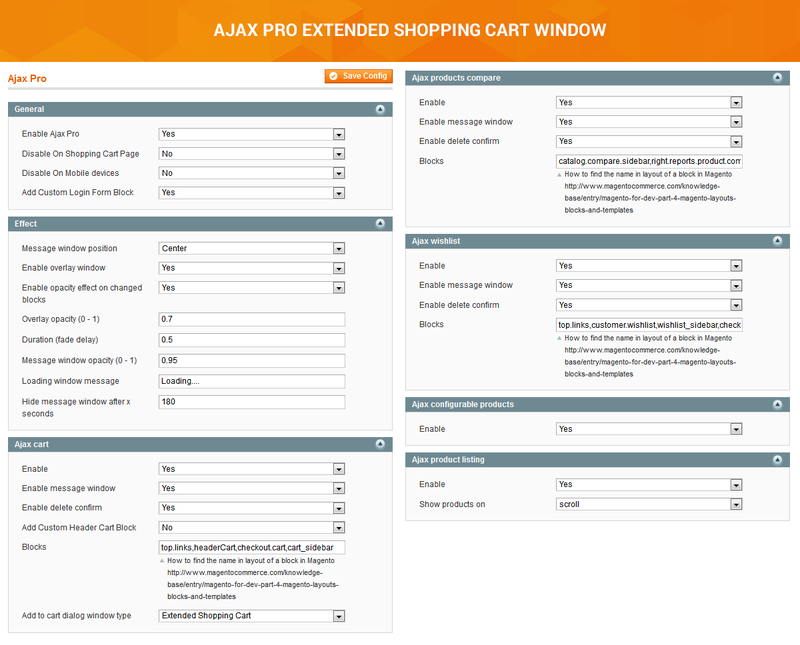 Choose Ajax Pro 3.0 extension as a way to improve your store performance with the display of extended shopping cart block. 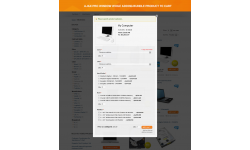 We offer you to show the added products in popup directly in a header of a web page. Your clients can follow or change the order right there. 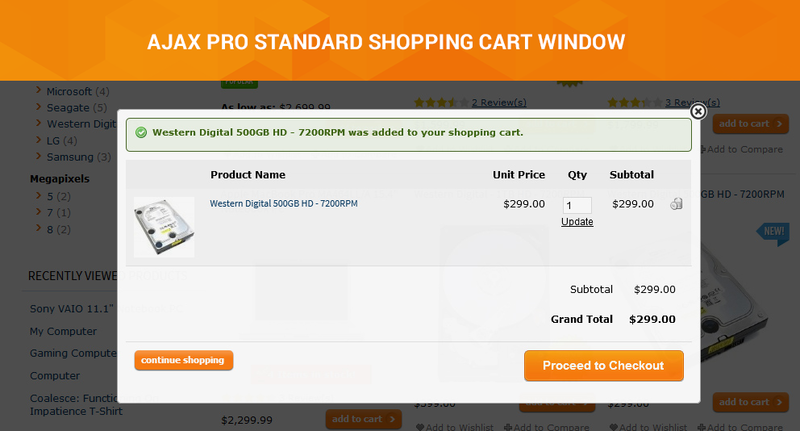 Let them view the cart or quickly navigate to the checkout page without the page reload. 5 window types with various shopping cart content are available. You can offer to continue shopping, view the cart, move to checkout, and even show other store offerings in a cart pop-up window. Help your customers make sure they can come back to the products they like even if they’re not ready to buy right now. 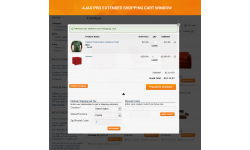 Allow clients to add the products to wishlist by using an Ajax feature as well to purchase later what they desire. 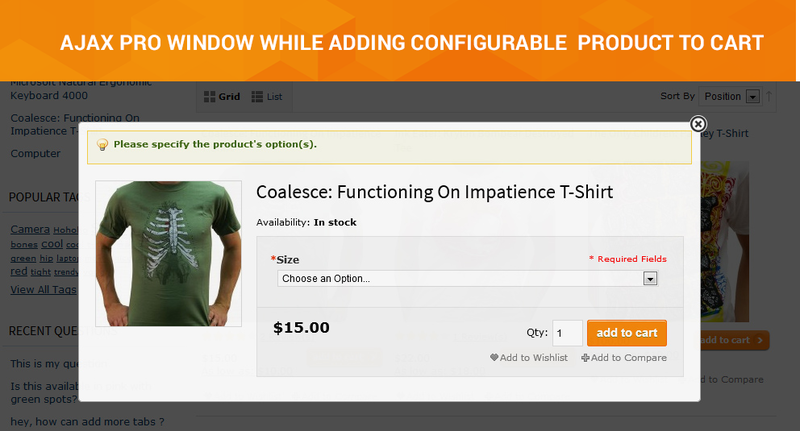 Our extension enables “add to wishlist” block via ajax functionality. It allows you to specify the block names to be updated without reloading the whole web page. 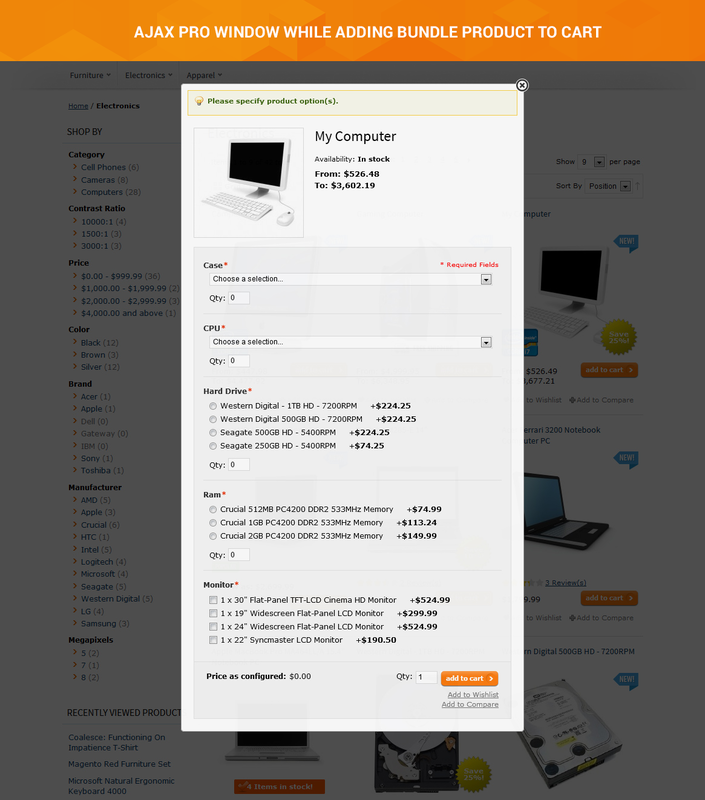 You can also enable the display of confirmation that the item was really added to the wish list. Suggest your clients compare the products and find out new combinations of your store's offerings. 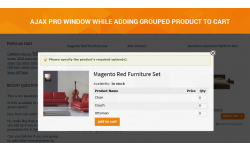 By using Ajax Pro 3.0 you can enable the display of a popup with the invitation to compare the items or continue shopping without page reload. Choosing the compare option your customers will be redirected to the new browser window to get the opportunity to collate all products attributes properly. 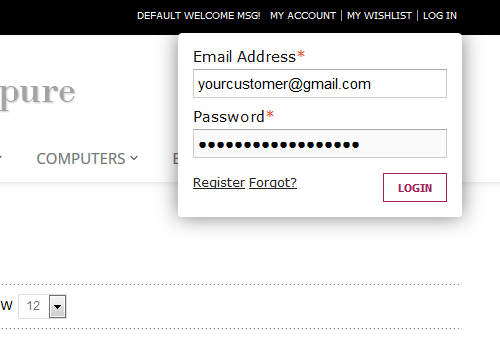 With Ajax Pro 3.0 you can add a custom Login form. It will be shown in top links block. The module comes with widely customizable ajax login pop-up. The following settings are available: message window position and opacity, overlay window opacity and effect on changed blocks, ability to hide the message, etc. Now you can create the positive impression with an invitation to log in. One of the Magento ajax rules provided by our extension, allows you to set the ajax block on the pages with configurable products. Besides bundle and simple products, your customers will be able to add the items with a lot of different options directly from the category page. 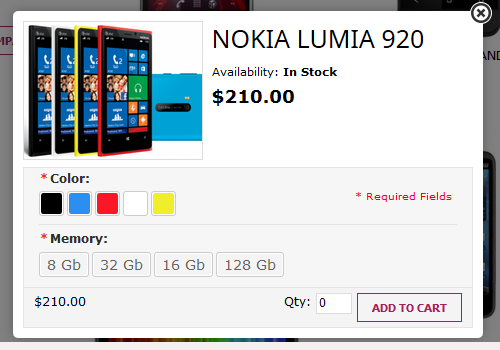 No need to navigate to the product page now. 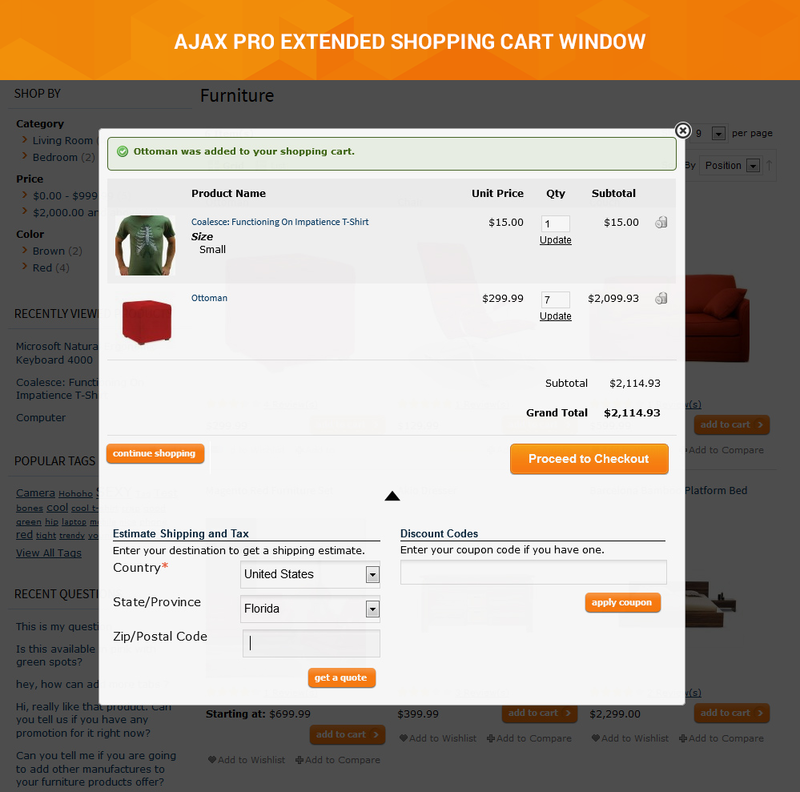 Ajax popup will offer to choose the item attribute. After submitting the product, the shopping cart will be updated. 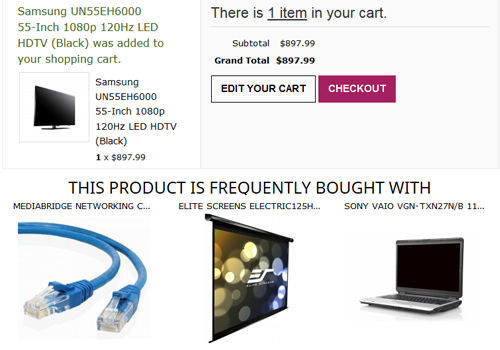 Motivate customers to buy more with the related products showcase in ajax cart. Ajax Pro 3.0 backend allows you to enable the different dialog window types. 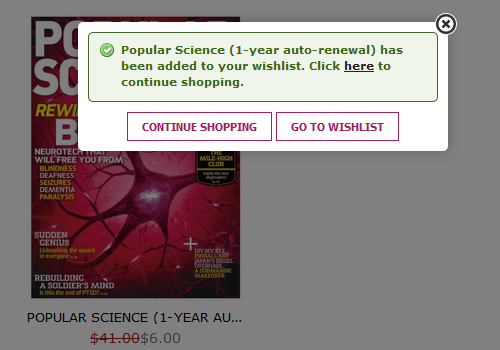 You can offer to view a shopping cart content, yo proceed to checkout and to suggest much more in the same popup. 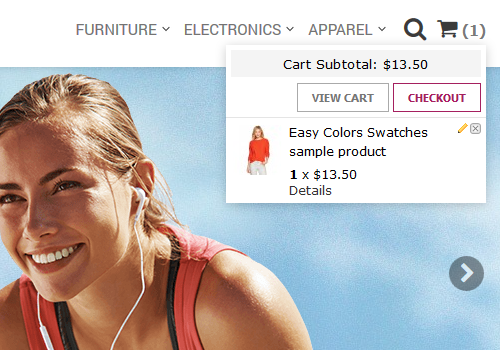 Place the cross-sells inside the cart and contribute up to to 30% of your e-commerce revenue. 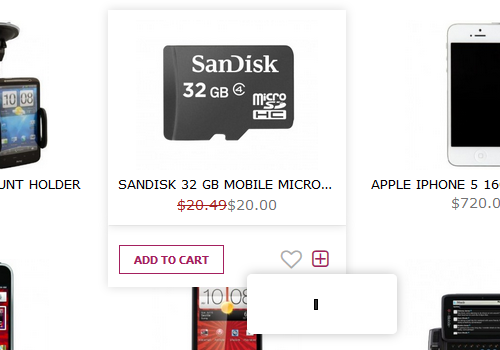 With our module, you can also provide your visitors with a discount input and the default Magento estimate shipping and tax block displayed next to the selected store products. Bring your website to the highest level of ajax power.